Why are we saying this over and over? Yes the band treats Stevie different. Its all about the money she brings to the band. Not until someone has doused the witch in holy water, ending this ****ing fiasco. IT.IS.UNFORGIVABLE. We won't move on. not to mention that that man lied to her... the gods did NOT answer her. The song was not a hit. His giving them the impression he saw commercial potential in that song should have been a red flag pushing them to the other label. There are dozens of threads and posts talking about this. Why start yet another thread? Fleetwood Mac obviously needed a clever project manager—someone to make some band-centric decisions and lay down the law (otherwise known as Hobson's choice)—after 1980. "Your tour schedule conflicts with the band's schedule. Guess who wins?" 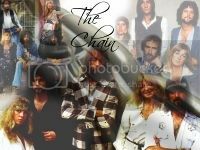 Solo activities started in 1980–81 as an outlet for Fleetwood Macsters to let off a little steam and find their center (even though there had been a few solo projects during earlier incarnations). But those activities wound up toxifying the band until finally the group paid a heavy price for all the individuals running off on their own. It entered a state of suspended animation—much of its audience (and maybe even a few of its members) thought repeatedly that it was dead. All of the maneuvering over the years to get the band back into a room together again was nothing but a lot of wasted energy. It's no wonder nobody enjoyed the recording or the touring. The finagling of schedules drained everybody. The moment you saw your fellow Macsters at the airport on the eve of a tour, you were already sick of them. I will take your point either further. This "suspended animation" really impacted the music. Mirage was an over correction from Tusk. Very commercial and SAFE. It also was vital to the band to have a successful #1 album to almost counter Bella Donna. Tango had even more pressure to be a commercial success. Its pure bubble gum pop even more than Mirage. Plus the suspended animation only allowed Stevie to spend very little time on the album. I am not trashing Mirage and Tango. But just imagine the music we could have gotten if the band did not feel the pressure to be commercial pop successful. When members are having extremely successful solo careers......they are not going to waste time and go back to the band if their music is not commercially successful. The White album, Rumours, and Tusk were much more organic and did not feel the fester and pressure to sell albums to counter solo careers. Last edited by Macfan4life : 12-27-2018 at 01:05 PM. Have you not heard or read? It must not stop until the wicked witch is dead, splashed with holy water or a full court exorcism. Not to scare anyone but I was watching Current Band concerts on youtube. Soon after Second Hand News the phone rang. "a whispering....Seven Wonders" No sh*t. If Stevie crawls out of my computer screen, I'm suing ! Last edited by Macfan4life : 12-27-2018 at 01:13 PM. [quote=cbBen;1246957]Aside from being untrue or at least exaggerated with respect to the timeframe of the requested delay, the purported reason for Lindsey's firing (asking for a delay of the 2018 tour) contradicts how the band treated Stevie's similar request in 2012. So on your other point - it is completely true and fair. Stevie knew the four (three, sorry) other members wanted to tour in 2012 to mark the exact 35th anniversary of Rumours. She asked - or more likely, just told them how it was - for a delay of one year and got her wish. Rude, selfish, and totally not worth it, from what I hear the 2012 Heart and Soul Tour with Rod sucked. So do you think they were gonna tell her to eff off? Fire the old witch from the band? And then without her go play to crowds of one thousand people or less. You're just going to have to accept, whether you like it or not, that FM cannot successfully continue unless Stevie Nicks is in the band. She can ask for another 3 years off after this tour and they will still be waiting for her when she returns. Love her or hate her, $he is the seat filler. Careful.....I know it’s Christmas, but you’re almost polite a about Ste.. I'll always be thankful that my last FM album, and last two FM shows were GOAT FREE. I'll never forget either show, and the love that was felt there. $he ruined FM, you know.